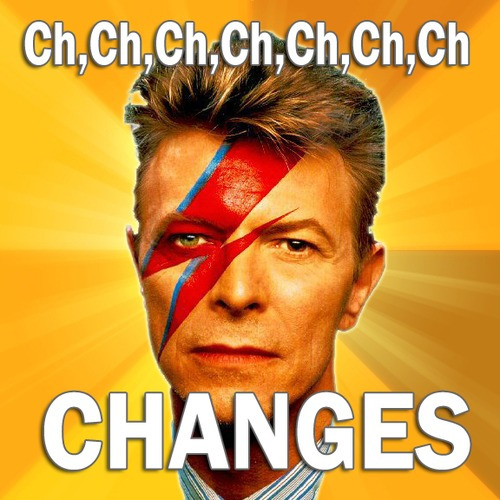 "Ch-ch-ch-ch-changes." Could David Bowie's 70s hit be a marketer's theme song, or what? On a related -- but arguably more serious -- note, according to the 2012 CMO Survey by the American Marketing Association and Duke University, Marketing appears to be one of the early rebounders in the initial economic recovery. In terms of both department size and budget, Marketing is on the rise. And as the role of marketing grows, it also continues to evolve. Today's marketing department, for example, looks very different than it did even just a few short years ago. In fact, a collection of new roles has emerged, and they're growing in importance within many marketing teams. Let's examine what each of these roles consist of, and why you might want to consider adding them to your growing marketing team. Marketing operations professionals are charged with monitoring, measuring, and analyzing the effectiveness of marketing initiatives as they relate to the overall company's goals. Marketing operations staff work closely with Sales, and sometimes also have a sales operations counterpart. Together, they manage the relationship between Marketing and Sales to ensure that both sides are optimized to deliver (Marketing's role) and work (Sales' role) the highest quality leads, something HubSpot has grown fond of calling "SMarketing." Marketing operations staff make projections about the quality of the sales and marketing pipeline and find efficiencies that will make the company work better as a whole. Marketing operations would be a fit for anyone who has an analytical mind and is interested in marketing and sales strategy. Karen Rubin, a HubSpotter in a marketing operations role adds: "We focus on helping our marketers get the analytics they need, running monthly reports, and understanding why data and results are looking the way they do at any given point." In 2011, Forrester released a report called "The Rise of the Chief Customer Officer." The report detailed a trend existing among B2B and B2C companies alike -- hiring an individual to oversee customer communications and customer happiness. While the report focuses on a formal, executive-level role ("CCO"), we've seen this trend at all levels in companies. Roles under this subset include community managers, customer experience designers, and customer communications officers. Skills and focus areas range, but the customer evangelist is essentially the internal voice of the customer within a company. Sometimes measured by Net Promoter Score surveys or user testing, their role aims to keep customer happiness and loyalty high by making customers' experiences with the company easy and rewarding. Beyond being "the right thing to do," creating a positive customer experience actually drives results. In fact, according to Nielsen’s April 2012 Global Trust in Advertising report, 92% of consumers worldwide trust recommendations from friends and family more than any form of advertising. In a socially driven market, the role of a customer evangelist becomes all the more critical. It's no news to us, but recent research from SiriusDecisions underscores the shift that B2B companies are making toward inbound marketing as a core strategy, and the need for more inbound marketing talent. "More than any other new approach, inbound marketing is rapidly becoming a standard part of the marketing mix," writes Jay Gaines, who leads SiriusDecisions’ Demand Creation Strategies advisory service. Inbound marketing strategists must have a comprehensive mix of skills including search engine optimization, content strategy, and content mapping against a lead's decision-making process. Gaines writes: "SiriusDecisions expects the inbound marketer to become a fixture in the majority of b-to-b marketing organizations in the next one to two years." As most savvy marketers will tell you, attracting traffic and converting those visitors into leads is only half the battle. All too many potential customers get stuck in the middle of the marketing funnel, never continuing on to make an actual purchase. Professionals skilled in lead nurturing help marketing teams deliver highly tailored content to guide leads to a point of decision. And research shows that personalized marketing leads to more customer conversions than generalized communications. The lead nurturing role in an organization is steeped in customer and lead data. According to that same AMA/Duke University CMO Survey, "The ability to leverage information about customers in order to deliver and demonstrate value opens the door for marketers to fill the role as analysts and 'data whisperers.'" Technology has lowered the barriers to creating high-quality videos, making creation and distribution more affordable for companies of all sizes. As a result, video as a form of content is on the rise. It's no surprise then, that 87% of online marketers use video content, according to Outbrain's State of Content Marketing. Not to mention that Social Media Examiner reported earlier this year that 76% of marketers planned to increase their use of YouTube and video marketing, making it the top area marketers would invest in for 2012. As part of this investment in video as a content format, many companies are adding videographers to their marketing teams. We asked Chris Savage, co-founder and CEO of Wistia, a video hosting and analytics provider, what companies should look for when hiring video talent. "Adding the right videographer to your team can unlock an entire new channel of content for you," said Savage. "The key is finding someone who has a mix of skills that complement your existing team. Besides just the basics of lighting, shooting, and editing, you really want someone who has a strong sense for what topics will be most successful on video." Co-marketing is the practice of two, complementary companies collaborating on content or marketing initiatives. As a result, co-marketing brings fresh perspectives to your marketing initiatives and helps each company reach an audience that might not otherwise have found them. In addition to the growing prominence of some newer roles, a number of existing marketing roles have begun to change and adapt as well. Here are some top trends we've noticed. Five years ago, a marketing department might have hired a young graduate to head up its social media strategy. But according to the 2011 Webmarketing123 State of Digital Marketing report, with an average of 68% of marketers generated leads from social media sites, social media is no longer a specialization but rather a core marketing skill. As such, new marketing hires at every level should be expected to understand and contribute to social media strategies. As you may have noticed above, analytics and data are playing a big role in emerging marketing positions. 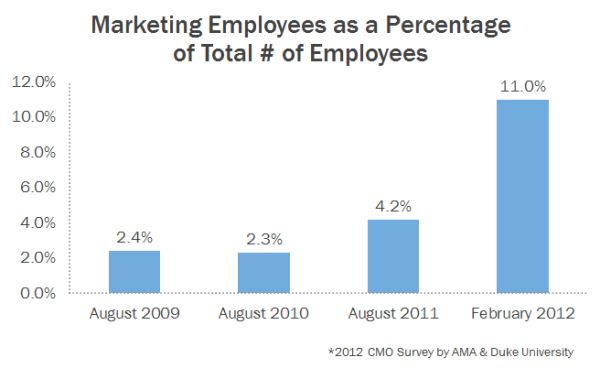 In fact, the AMA/Duke CMO survey cites that spending on marketing analytics is expected to increase 60% by 2015. As marketing departments grow in size and marketing budgets increase, the ability to measure the effectiveness of marketing campaigns and channels will become more and more essential. Read more about how to cultivate a data-driven marketing team in this blog post. In a Gartner study, Vice President of Marketing Strategies Laura McLellan asserts, "By 2017, the CMO will spend more on IT than the CIO." Her assertion is backed by survey data in which 90% of respondents said that the marketing department is either solely responsible or leads a cross-functional team that sets the strategy for technology purchasing decisions. Marketers have more and more say in the technology they use to do their jobs. Enough said. According to the AMA/Duke University CMO survey, only 53% of companies are using marketing staff for traditional public relations activities, which is a significant step down from 65% in 2011. Talking with Laura Fitton, HubSpot's inbound marketing evangelist, you'll quickly learn that she prioritizes being helpful to journalists and bloggers over pitching to them. Even when it doesn't result in a news story about HubSpot, Laura's priority is to help journalists make connections and find data for their reports. In all of these developments and newly emerging roles, there are a few overarching trends: The importance of data, useful content, and relationships are on the rise. With these trends in mind, here are a few tips for interviewing today's inbound marketer. And for those of you on the other side of the interview table, here's how to get hired as an inbound marketer. What new roles have you added to your marketing team? What roles would you add if you had the capacity? Share with us in the comments.